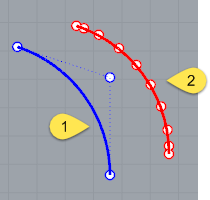 The Arc command draws an arc with options for a center location (1), one end point (2), and a second end point or an angle (3). The Center option is the default. 1. Pick the center of the arc's radius. 2. Pick the arc's first endpoint. This point is also the arc's start point. 3. Pick the arc's second end point, or type an angle. The Deformable option draws a NURBS approximation of the arc with a specified degree and number of control points. Default degree-2 arc with three control points (1) . Deformable degree-3 arc with ten control points (2). Specifies the degree of the arc. When drawing a high-degree arc, the output curve will not be the degree you request unless there is at least one more control point than the degree. Specifies the number of control points. The Tilted option draws an arc whose plane is tilted from the current construction plane. 1. Pick the arc's center, and choose the Tilted option (type T). 2. Pick the start point for the arc. 3. Drag the mouse to start a three-point rectangle that defines the orientation of the tilt. 4. In a different viewport from the start point, using reference geometry, or with elevator mode, drag the rectangle to the angle of the tilt. 5. Pick the arc's endpoint, or type an angle, or choose the Length option (type L). The Length option sets the arc length as measured along the arc. Type a positive or negative number, or pick two points to specify the arc curve's length. The StartPoint option draws an arc starting from the first end of the arc. 1. Pick the arc's start point. 2. Pick the arc's end point. 3. Click a location the arc passes through. The Direction option specifies the direction of a line tangent to the arc's start point. 1. Pick a start point. 2. Pick the direction the arc will be tangent to at the start of the arc. 3. Pick an end point. As you move the cursor, a center point for the arc appears as a reference. The ThroughPoint option specifies a location the arc curve must pass through. 2. Pick a location for the arc to pass through. 3. Pick the arc's endpoint. The Center option specifies a center point for the arc's radius. 2. Pick the arc's center point. The Tangent option draws an arc tangent to selected curves with options to pick a point not on the selected curves or to specify a radius. 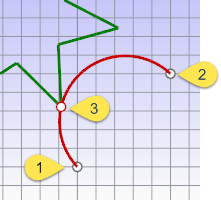 Each prompt allows you to pick a point that is not on a curve for the arc to pass through. At some prompts, the option to enter a radius appears. 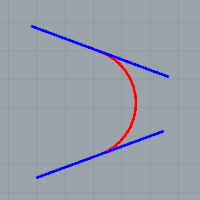 The red arc is tangent to both blue lines. 1. Select a curve to make the arc tangent to. 2. Select a second curve to make the arc tangent to. The tangent indicators adjust to fit the arc tangent to the two curves. 3. Select a third curve to make the arc tangent to. The tangent indicators adjust again to fit the arc tangent to the two curves. Or press Enter to draw the reference circle from the first two points. 4. Drag the cursor around the arc, and click to choose from the suggested possibilities. The Point tangent option appears for each prompt. It releases the command from the tangent constraint for that pick. At any prompt, choose the Point option, and pick any point for the arc to pass through. In this example, the Point option is used to establish the first point on the arc. 1. At the First tangent curve ( Point ) prompt, choose the Point option, and pick any point. 2. At the Second tangent curve or radius prompt, select a curve. 3. At the Third tangent curve prompt, select a curve. 4. At the Choose arc prompt, drag the cursor around the arc, and click to choose from the suggested possibilities. The Point option is used for the first pick. In this example the Point option is used to establish the second point on the arc. 1. At the First tangent curve ( Point ) prompt, select a curve. 2. At the Second tangent curve or radius ( Point FromFirstPoint ) prompt, choose the Point option, and pick any point. The Point option is used for the second pick. The FromFirstPoint tangent option forces the arc to go through the first picked point on the curve instead of allowing the point to slide along the curve. In this example the FromFirstPoint option is used to establish the start point on the curve. 1. At the First tangent curve prompt, select a curve. The tangent cursor slides along the curve. 2. At the Second tangent curve or radius ( Point FromFirstPoint ) prompt, choose the FromFirstPoint option, and pick a location on the curve. 4. At the Choose arc prompt, only two options are available since the first point on the arc is restricted to the location on the curve. Drag the cursor around the arc, and click to choose from the suggested possibilities. The Radius option specifies a radius. If a tangent point exists on the second curve that meets the radius requirement, the tangent constraint will appear at that point as you drag the circle. In this example the Radius option is used to establish the size of the arc. 3. At the Third tangent curve prompt, choose the Radius option and type a radius value. 4. At the Choose arc prompt, only two options are available since the arc is restricted to the radius specified. Drag the cursor around the arc, and click to choose from the suggested possibilities. 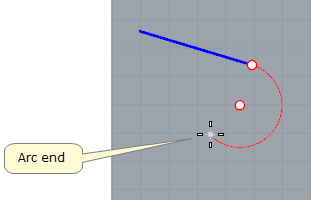 The Extension option extends a curve with an arc to a specified end point. 1. Pick the curve to extend. 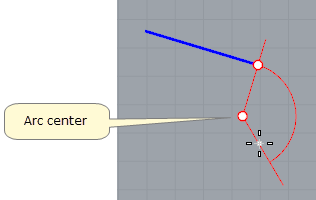 The Center option extends a curve with an arc by from a specified center and end point. 1. Pick the arc's center point. The Length option sets the arc length, measured along the arc. Type a positive or negative number or pick two points to specify the arc curve's length. The Direction option sets the direction for drawing the arc. The Counterclockwise option draws the arc in a counterclockwise direction from the start point. The Clockwise option draws the arc in a clockwise direction from the start point. ● The arc extension is not joined to the original curve. ● To draw an arc extension and join it in one step, use the Extend command. ● The center point is constrained to a plane perpendicular to the curve end. 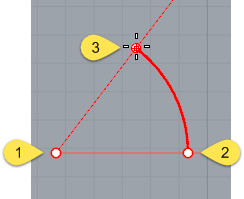 If the extension is drawn in a view perpendicular to the constraint plane, the input will be automatically locked parallel to the construction plane. ● In other views Rhino tries to make sure one of the ortho directions is parallel to the construction plane. Press Shift when making the pick to maintain the ortho direction.